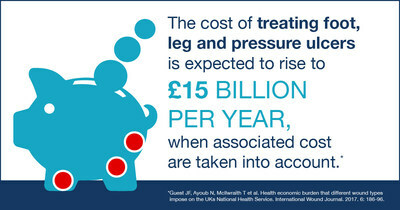 LONDON, Jan. 31, 2019 /PRNewswire/ -- A new treatment option for venous leg ulcers and diabetic foot ulcers that could prevent more than 3,0001 diabetes-related amputations is recommended by NICE2 (The National Institute for Health and Care Excellence), following a comprehensive review of ground-breaking clinical studies in addition to expert opinion and advice. "It's hard enough living with type 1 diabetes; a foot ulcer is an added stress. In the past, when I had a foot ulcer, treating it was such an arduous process. With UrgoStart it is so much easier and more effective - the skin soon started to look healthy around the ulcer and there was a better blood supply. The size reduced really quickly, going from a deep hole to nothing at all. I would recommend it to anyone." "We're absolutely delighted by this announcement. We have an intensive research and development programme which we believe is revolutionising the wound healing market. UrgoStart is more than a dressing; it is a treatment that has a full role to play in the protocol of patients with leg ulcers and diabetic foot ulcers. "The NICE decision endorses our commitment to developing evidence-based treatments and means thousands more patients will have access to the UrgoStart treatment range. UrgoStart Plus is part of the same treatment range, composed of two exclusive technologies, TLC-NOSF Healing Matrix (NOSF* impregnated in a TLC healing matrix) and poly-absorbent fibres. These unique poly-absorbent fibres bind, trap and retain exudate, slough and debris present in the wound, keeping it clean throughout healing. UrgoStart Plus, in addition to reducing healing time, offers simplification of treatment choice: one single solution for all leg ulcers, diabetic foot ulcers, pressure ulcers acting from day 1 to complete healing. NICE Guidance Medical technology guidance: UrgoStart for treating diabetic foot ulcers and leg ulcers. Available at: https://www.nice.org.uk/guidance/mtg42. French Health Insurance Report to the Ministry of Health for 2014, July 2013. Edmonds M, Lázaro-Martínez JL, Alfayate-García JM, Martini J, Petit JM, Rayman G,Lobmann R, Uccioli L, Sauvadet A, Bohbot S, Kerihuel JC, Piaggesi A. Sucrose octasulfate dressing versus control dressing in patients with neuroischaemic diabetic foot ulcers (Explorer): an international, multicentre, double-blind, randomised, controlled trial. Lancet Diabetes Endocrinol. 2018 Mar;6(3):186-196 Available at: https://www.ncbi.nlm.nih.gov/pubmed/29275068. Meaume S, Truchetet F, Cambazard F, et al. A randomized, controlled, double-blind prospective trial with a Lipido-Colloid Technology-Nano-OligoSaccharide Factor wound dressing in the local management of venous leg ulcers. Wound Repair Regen 2012; 20: 4, 500–511. Münter KC, Meaume S, Augustin M, Senet P, Kérihuel J.C. The reality of routine practice: a pooled data analysis on chronic wounds treated with TLC-NOSF wound dressings. J Wound Care. 2017 Feb; 26 (Sup2): S4-S15. Erratum in: J Wound Care. 2017 Mar 2; 26(3): 153. Please contact: Donna Gregory, Donna.gregory@interactionpr.co.uk or Karen Rowe, Karen.rowe@interactionpr.co.uk. Tel 01233-732769.